The Pittsburgh Penguins can't seem to catch a break when it comes to injuries. I guess we all we were all kidding ourselves if we thought that the Pens' players that were representing their countries in Sochi, for the Olympics, were all going to make it through without an injury. Defenceman Paul Martin injured his wrist and will now be out 4-6 weeks. That, along with the fact that Kris Letang is out indefinitely means that the Pens are now very thin on the blueline. Despite the fantastic play and continuing performance of rookie Olli Maatta, the Pens now have to consider their defensive group thin and kind of weak at this point. Especially considering the way that veterans Brooks Orpik and Rob Scuderi were playing heading into the break. Robert Bortuzzo will continue to get a look thanks to the injuries to Letang and Martin. But who will the sixth defenseman be? At this point the Pens will most likely move Deryk Engelland, who was playing forward, back to defense. Head coach Dan Bylsma is a fan of the way Engelland plays and most reports suggest that Engelland will get the sixth spot on the blueline. The alternative to Engelland would be Simon Despres. Despres was recently called up to from Wilkes-Barre Scarnton when the news of Martin's injury hit. The 22-year defenseman, a former first-round pick, has had an interesting start to his career in Pittsburgh to say the least. Last year, Despres impressed a lot of people in his 33 games played. Playing alongside Letang for most of his playing time, looked very good, tallying nine points, including two goals, and was a +9. In fact, Despres was so good that the hashtag #FreeDespres would have a huge presence on social media when Despres would be left out of the lineup. 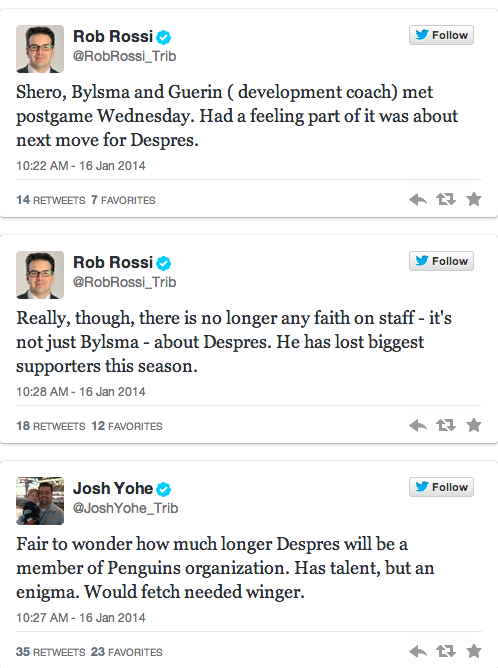 Bylsma was heavily criticized for leaving Despres out of the lineup. During the offseason, Bylsma called Despres a "Top-four defenseman". Many Pens' fans took that literally, thinking that Bylsma and the Pens were planning on using Despres in a top-four role this year. That quickly died down when the Pens signed Scuderi and with the breakthrough performance of Maatta during preseason. Then there was reports that Despres came into training camp out of shape and even other reports of him having an attitude problem. As for Despres, he's played in Pittsburgh sparingly, despite the amount of injuries the Pens have suffered on the blueline. In fact, the Pens have even scratched Despres in favor of Engelland and Robert Bortuzzo at times. Once again that could be the case. On top of all of that, Despres is constantly the most talked about player when it comes to being trade bait for the Pens. Nothing but questions regarding the very skilled Despres. Despite being talented and a former first-round pick, does he have a future with the Pens and if so what is it? Has he truly been as disappointing as some have suggested. For these and many other questions regarding Despres, I decided to bring in Tony Androck, who covers the Pens' AHL affiliate, Wilkes-Barre Scranton. Me: Tony, thanks for joining me. Tony: Anytime Chad, thanks for having me. Me: 1. I continue to hear that Despres is struggling in Wilkes/Barre Scranton, can you evaluate his recent play leading up to his call-up? Tony: His (Despres) numbers are down this month (a minus two in nine February games versus a plus seven in eight January games) but I'm not sure I would say that he's "struggling". He's been on the top pairing with Philip Samuelsson most of this season and he has also been logging special teams minutes on both the PP and PK. I think it's more of a team in a rut kind of a deal than just one or two guys you pick out and say they're struggling. The exits out of the defensive zone haven't been consistently crisp and clean during the recent six-game win-less streak. Me: 2. Does Despres have a future in with the Pittsburgh Penguins? And if so, how exactly do you see him fitting in? Tony: It's an interesting question with Despres and this is certainly a big season for him considering it is his last season of waiver exemption. There's a ton of defenseman in the Pens organization on the last year of their contracts including three UFA's (Orpik, Niskanen, Engelland) and three RFA's (Despres, Samuelsson, Mikkelson). What they do with the three UFA's will likely determine Despres' fate. Hate to answer your question with a question but I think it comes down to whether you like Despres on your third pairing next season (he can be qualified for roughly $1 million next season) enough to free a roster spot for him. Me: 3. Where does Despres rank among the current group of defensive prospects for the Pens right now? Tony: I'd definitely say that Despres is the most NHL-ready of the AHL defensemen, but as for highest ceiling I haven't watched much of Derrick Pouliot but I think Scott Harrington can be molded into a reliable steady two-way defenseman you could pair with his former London teammate Olli Maatta. Harrington has 17 points (3G-14A) in 54 games in his rookie season on the second pairing with Brendan Mikkelson for much of the season in the AHL. Goes unnoticed most nights, which isn't really a bad thing, but certainly has more to learn about the pro game before he is NHL-ready. Me: 4. With this recent call-up, is this Despres last chance to impress the Pens at the NHL level? Tony: Kind of goes back to what I said for #2, but this is certainly his best chance yet to make a case to become an NHL-regular. With Martin and Letang out, Pens have seven healthy defenseman including Despres so it looks as though he will probably split time amongst Bortuzzo and Engelland? I don't think Despres is going to be traded now, with Martin/Letang out and Brian Dumoulin recovering from a lower body injury, unless Ray Shero has some tricks up his sleeve for the trade deadline. I guess you never know, but I think it's best chance if he can get in some games in the next month and a half or so. I definitely think Despres deserves another opportunity to show that he has the ability to be a consistent player at the NHL level for the Pens. With Letang and Martin out, and the fact that Niskanen and Orpik are both unrestricted free-agents after this season, I'm not so sure the Pens should be so eager to trade Despres, especially if it's for a rental player. Sure, Despres is going to make mistakes, he's going to take bad penalties at times, and he will turn the puck over. The Pens have to remember that Despres has a huge upside. He's a big guy at 6'4 but has plenty of skill, and is a very talented skater. 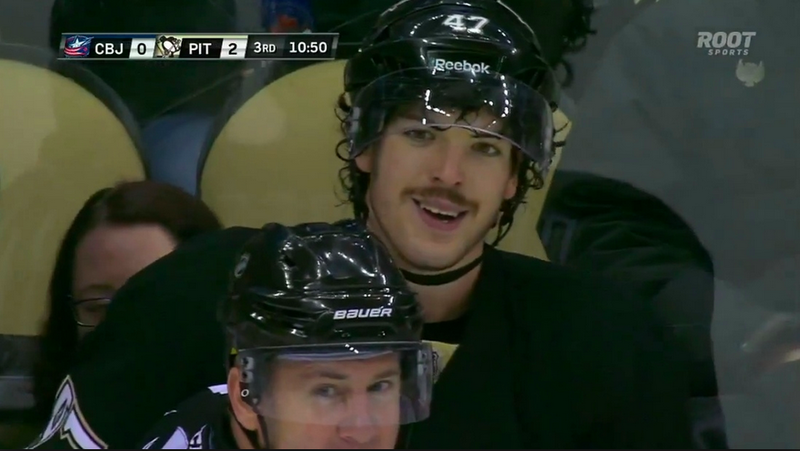 Right now, Despres fits a need for the Pens in my opinion. Especially with Letang and Martin both out. Bortuzzo, Engelland, Orpik, and Scuderi are all stay at home defenseman, leaving Maatta and Niskanen the only puck-carrying defesnemen on the roster, other than Despres. The only logical thing to do is to let Despres play for the time being, to truly gage where he's at. Even if the Pens plan on trading Despres, wouldn't his trade value go up with more NHL experience? All of these questions will only be answered with Despres getting another shot. Can he make the most of it if he does? Only time will tell.